Diabetes Mellitus was described in the medical writings of the fifth century BC Greece. The name itself is from the Greek (dia, through; bainein, to go; melitos, honey). Diabeties was diagnosed by the sweet taste of patients' urine, their excessive thirst, and the agony of their inevitable death. Although the method of diagnosis was slightly less crude by the beginning of the twentieth century, little else changed in the natural history or course of this disease for 2500 years. Only with the discovery of insulin by Banting and Best in the year 1922 did the modern era of diabetes as a chronic, nonfatal disease begin. In the more than 75 years since that landmark discovery, the science of medicine has unfolded the myriad multi-system complications by which this protean disease is now well known. The Canadian and American Diabetes Association currently estimates the diabetic population in the United States and Canada as 25 million and rising as the average age increases, since the incidence of diabetes increases as we get older. At least half these persons are estimated to be undiagnosed. Foot problems, (especially infections), are the most common disorder necessitating hospital admission, and an estimated 25% of all diabetic patients' hospital admissions are for pathologic conditions of the feet. Far from being an esoteric problem, the diabetic foot and its complications are encountered by practitioners in many different specialities – Chiropodists, Podiatrists as well as Orthopaedic Surgeons. The incidence of diabetes has increased dramatically in people over age 40 years, with an estimated 15% of the population over age 65 being affected. The cost in morbidity, mortality, and time lost from work and family is enormous. Greater than half of all non-traumatic amputations are done in diabetic patients, who have a higher risk of developing peripheral vascular disease, having gangrene in an extremity, or requiring a major amputation. Each of these carries a higher mortality rate than in non-diabetic persons. The risk of peripheral vascular disease increases with the duration of diabetes. The pathways to amputation are varied because of the multiplicity of pathologic changes that affect the diabetic lower extremity. The severity of the complications of diabetes in the foot is not necessarily related to the severity of the disease itself. The majority of complications occur in patients with milder forms of the disease, that is, those with non-insulin-dependent (type II) diabetes mellitus (NIDDM), who account for the large majority of the diabetic population. Despite all the advances in the field of diabetic foot care, including better control of hyperglycemia, the discovery of a multitude of new antibiotics, advanced surgical and nonsurgical techniques for vascular reconstruction, excellent foot care practitioners, the treatment of problems of the diabetic foot remains obscure if not puzzling to many physicians and foot specialists. Depth Classification: The ”at-risk” foot: previous ulcer or neuropathy with a deformity that may cause new ulceration. Treatment: Patient education; regular examination; appropriate footwear and orthotics. Treatment: External pressure relief: total-contact cast, walking brace, special footwear, orthotics. Depth Classification: Deep ulceration exposing a tendon or joint (with or without superficial infection). Treatment: Surgical debridement wound care pressure relief if the lesion closes and converts to grade 1 (prn antibiotics). 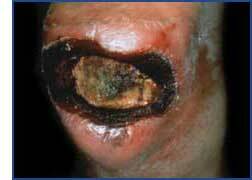 Depth Classification: Extensive ulceration with exposed bone and/or deep infection (i.e., osteomyelitis) or abscess. Treatment: Surgical debridements, ray or partial foot amputations IV antibiotics pressure relief if wound converts to grade 1.
poor healing, usually combined with a superimposed infection. Currently, the best of all possible standard medical diabetic foot treatments is revascularization (restoration) of the affected organ, which can reverse some of the effects of necrosis (tissue loss) and allow healing of the tissues. Preventative measures are always the best defence against diabetic foot problems.